When I was about 30 years old my father, Bjorn Egeli, told me that he had painted a portrait of Princess Märtha of Norway. He never said where or when this was done. After he died I went through the papers left in his studio, and while he kept very organized records, I never found any mention of the Royal portrait. Over a decade later, a "lost" cousin from Norway by the name of Dag Hoelseth reached out to me by e-mail. We have had a growing friendship with Dag and his family since then. Once, I asked Dag to see if he could locate Princess Märtha's portrait in Norway, but he had no luck. 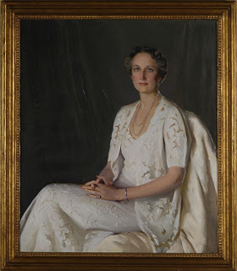 On Sunday, January 17, 2016, I received an email from Ingeborg Lonning, Head of The Royal Collection at The Royal Court, asking me if it was possible that my father had painted Princess Märtha's portrait. She had come to Washington, D.C, during WWII, with her children including her son, Prince Harald, who is now King Harald V of Norway. Ms. Lonning emailed a photograph of the work. I could not answer her fast enough and relayed what my father had told me many years ago. I also enclosed a photograph of a portrait by Bjorn of Mrs. Pierre DuPont, in a similar pose to that of Princess Märtha, painted around the same time. A rapid exchange followed and it was clear that we were both pleased to solve the mystery of the grand, unsigned and undated painting. Bjorn Egeli was a highly sought-after portrait painter in the early part of the 20th Century. For years, he maintained a studio in Washington, DC, and it is most likely that the portrait was painted there. 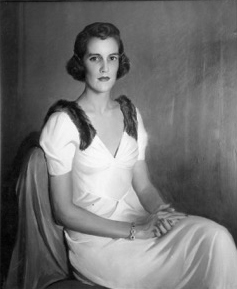 Usually, my father would have three to five sittings with his clients, working from life, and this presumably would have been his approach with the portrait of Princess Märtha. We know about many of Bjorn's other portraits painted around this time, including the above-mentioned Mrs. DuPont, but also fellow Norwegian-Americans Dr. Leonard Stejneger and Ruel Tolman (both paintings in the collection of the Smithsonian Institution*). Last year I published a book about my father's life and work, and it includes many examples of the portraits he painted during his long and distinguished career. There are also many of his paintings, both portraits and marine paintings, that are "lost", and I would love to find and document them. The discovery of this portrait of Princess Märtha fills an important void in the record of the career of Bjorn Egeli. It is gratifying to know it has been displayed and cared for in the Royal Palace of Norway, and even more gratifying to know my father can now be credited for his work. Copyright 2013-2016 Peter Egeli, Ltd. All rights reserved. Images may not be copied or reprinted without the expressed written permission of Peter E. Egeli.